It was the Summer of 1973, the ‘Hippie movement’ of the 1960’s still existed, but only in isolated pockets, tucked away in dusty cobwebbed corners of the counterculture. 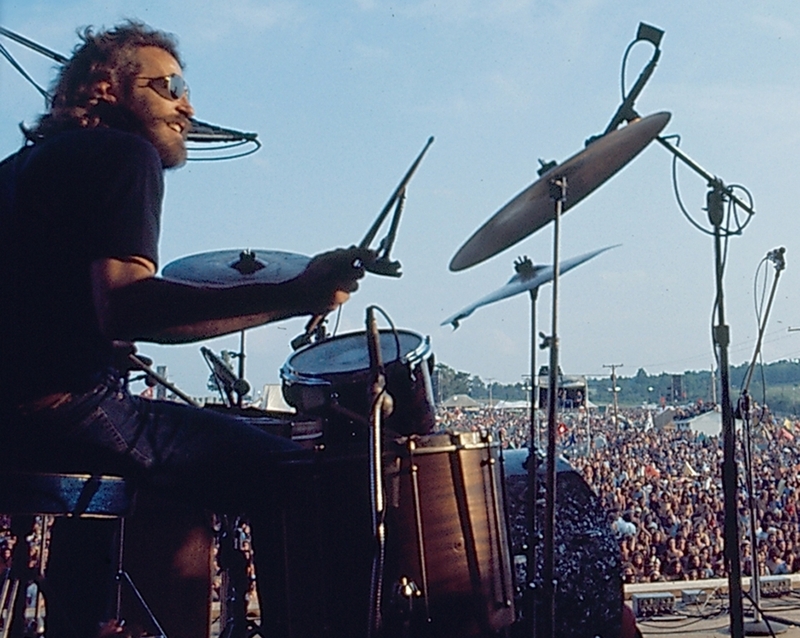 Groups like the Grateful Dead, Allman Brothers Band, and The Band were still playing to crowds that held tightly to the ideals of the mid 1960’s, which the groups themselves still carried on through their music. The band’s, were also undergoing personal changes reflected back at them through their audience. 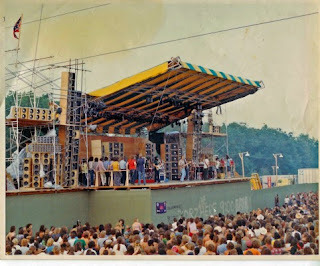 The genesis for 1973’s Summer Jam began as a brain storm by promoters Shelly Finkel and Jim Koplik who had discussed and planned on setting a line up for the ages. After seeing members of the Allman Brothers Band sit in with the Grateful Dead at a Summer 1972 concert at Roosevelt Stadium the seed was planted to bring together an astronomical set of musicians for a gathering to rival even Woodstock, boy, would they be surprised. 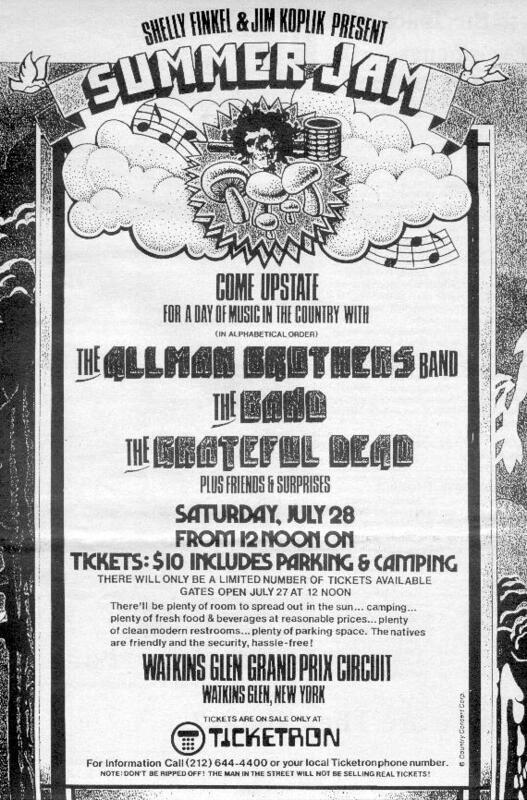 The decision to bring The Band on board came by the promoters asking the Dead and Allman’s which artist they would most like to have join them on the bill, the decision was easy and unanimous. Plans were put in place and and set in motion. Roughly 150,000 tickets were sold at $10.00 a piece for the show, large by any standard of measurement. To everyone’s surprise, by the evening prior to the concert that number of intrepid travelers had already showed up to the festival site. By show time on July 28th the number would exceed an estimated 600,000 fans! Often overshadowed by other festivals in the annals of rock history, the show became something different than originally planned, but ended up being remembered fondly by all participants. The concert also seemed to signal the end of an era, ushering in a time where festivals became corporate interests instead of private excursions into the unknown. Soon to be gone were the days of Monterey, Woodstock, and the Isle of Wight, properly concluding with the biggest of them all ‘Summer Jam’, situated smack dab in the middle of New York State. 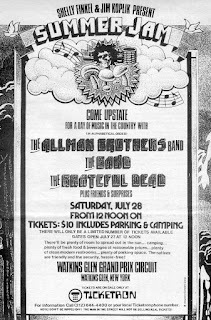 Two of the principal performing artists, The Grateful Dead and Allman Brothers had recently lost founding members, Pigpen for the Dead in March of 1973, and Duane Allman and Barry Oakley for the Allmans in 1971 and 1972 respectively. These deaths caused a restructure and reassessment of both bands musical futures which at this point seemed somewhat uncertain for both groups. The Band on the other hand was also hanging by a thread because of personal issues regarding publishing, as well as substance abuse seeping into the fabric of the group. The ‘Summer Jam’ acts as a celebration of the recent past for the artists involved, as well as a signpost to an unknown future. For the Grateful Dead, the festival featured one of their usual blistering 1973 sets, in addition to an perfectly encapsulated instrumental journey tagged as one of their finest, hailing in true Grateful Dead fashion from the sound check. The Allman Brothers played an extended and crisply executed set featuring new songs from their retooled line up and fiery soloing from Dickey Betts .Robbie Robertson has often been quoted that the Watkins Glen set was one of the legendary performing moments by the boys, and will go down in history as one of their best. 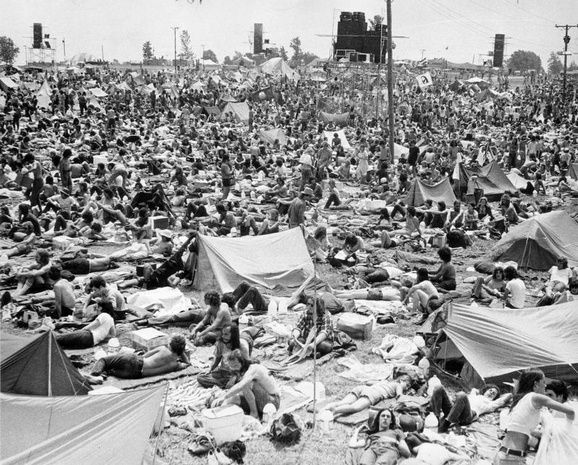 In spite of prior planning by the promoters and authorities leading up to the evening of the concert, roads and highways were still backed up for a hundred miles, stores in Watkins Glen and surrounding areas were wiped of groceries and beer, and over 150,000 folks were waiting at the 95 acre concert site a night early. Routes 14 and 17 were gridlocked, and even secret back road entries were congested with abandoned cars, forgotten ground scores and backpacking travelers making their way to the festival site. In order to collate the documentation of the entire weekend I have collected a number of sources; combining official releases, soundboard leaks and skeevy audience recordings in order to create a detailed view of the entire event. There also circulates fan assembled collections that place all of the best available sources in one place. While the sound quality varies dramatically these are the most complete ways to enjoy the concert. 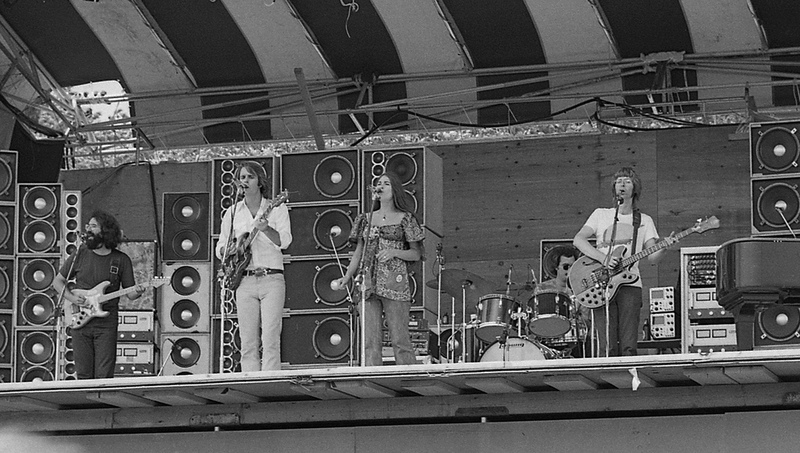 The Grateful Dead's Watkins performances circulate on soundboard, while the Allman's and Band sets are field recordings with various tracks floating around in soundboard quality.There are also soundboards available of the Grateful Dead’s following performances with the Band on July 31,and August 1, 1973 which also offer stunning enjoyable musical joint concerts. The day of July 27th 1973 found the band’s arriving, scoping out the situation, and standing slack jawed at the amount of people already at the festival site. 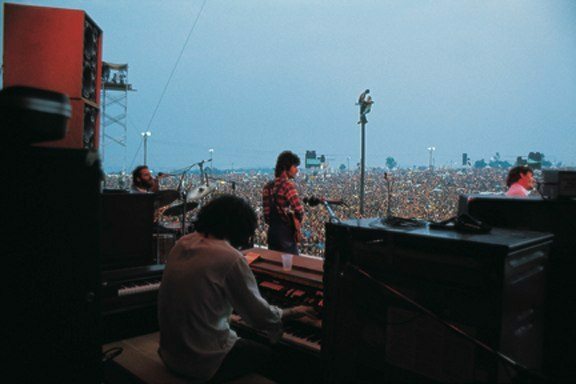 Legend tells us that when Robbie Robertson guitarist of The Band inquired about a sound check in preparation for the expansive outdoor venue, all three bands decided to do the same thing that evening and make it a mini performance. What happened next is the stuff legends are made of. All three bands played beautiful sets to the lucky early arrivals. The Band ran through a couple of their well know classics as well as jamming on a few unique instrumental grooves that harkened back to their days as The Hawks, when they were still playing Toronto bars and clubs. A crushing ‘The Night They Drove Old Dixie Down’ opens the ‘rehearsal’ and is answered by encouraging crowd feedback. The instrumental groove the group break into following ‘Dixie’ is jump started by Danko’s smooth fretless bass flourishes and the rest of the band falling in line with a jumpy Levon Helm swing. Robertson’s Stratocaster draws blood with its stinging ring cutting through the somewhat marginal sound quality. Another jewel of the practice session is the rare Danko sung version of ‘Raining in My Heart’, a bit jagged, but oh so charming. The Allman’s followed and also ran through a rough and ready sound check that was made up of a few songs planned for the next evening including ‘Ramblin Man’ and ‘One Way Out’, short but sweet when compared to what would follow. 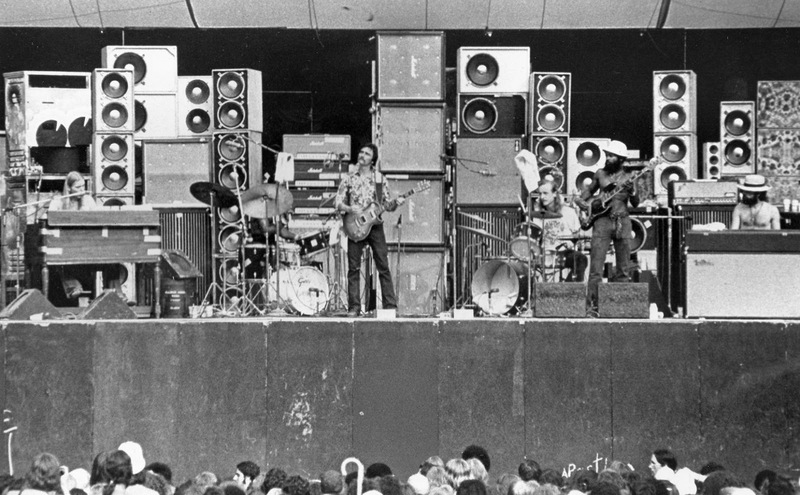 When the Grateful Dead approached the stage for their ‘rehearsal’ segment little did the band or assembled throng know what they were in for. The Grateful Dead’s ‘sound check’ appeared as two sets lasted an hour and a half, but according to many opinions and in true Grateful Dead fashion possibly outshines the next day’s 'official' performance. The bonus being the performance circulates in pristine quality unlike songs from the other participants of the concert. The unique improvised instrumental jam that preceded ‘Wharf Rat’ is an anomalous display, never to recreated, and is one of those magical Grateful Dead moments made for the time in which it was born. The jam appeared years later on the official release box set ‘So Many Roads’ proof of its distinguished standing in the Dead’s long and varied history. Prior to the sound checks first highlight ‘Bird Song’, Phil Lesh states ‘This whole thing is a fraud, we’re really clever androids’, as they band prepares to levitate off of the ground. ‘Bird Song’ comes skipping in, riding with Kreutzmann on the humid Summer evening breeze. Succulent and patient Garcia and Lesh probe the soft cloudy edges of the jam, floating in space. Expansive yet slightly tentative, the ‘Bird Song’ jams wings are lifted by the gusts of inspiration starting to stir. After polished and well played versions of various first set classics, including a big fat ‘Tennessee Jed’, the band finds itself in one of those sacred spaces, where the music eventually plays the band, and all bets are off. The unnamed jam grows from silence, quietly, pensively, with light cymbal hits and the guitarists peeking around corners probing into darkness. Lesh increases the intensity with some fuzzy chording; Weir gives the musical drift a tangible shape with perfectly timed strums. 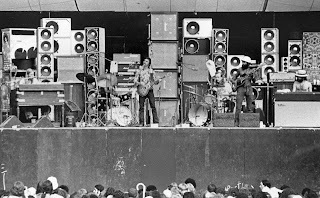 Lesh then begins to drone and detonate, the band turns into particles and star dust, breaking apart, and then coagulating as a Garcia led jam rises from nothingness. Billy K catches on, Garcia sets the rhythm and the band achieves lift off. Slick, smooth and jazzy, the band improvises idea after idea. Weir strikes out with nervous lush rhythmic ideas, Phil hides and seeks, and Garcia peels off layer after layer of juicy skin revealing the jam’s plump and succulent center. The band sinks their teeth deep into the music creating one of their finest moments in front of the lucky crowd who descended early upon Watkins Glen that Summer night of 1973. An endless stream of collaborative ideas pours from the group like the icy waters raging through the shady tree lined Watkins Glen only a few short miles away. Some of the melodies are familiar, some are brand new, some mix and match like oil and water, some blend like paints on an artist’s pallet. The edges of ‘Dark Star’ are skirted but never infiltrated because this is undiscovered land. One of the finest musical moments in the Grateful Dead's long and storied history has just occurred, thankfully captured for posterity. An audacious beginning to a concert event that hasn't even ‘started’ yet! The jam eventually dissolves into a fitting and lucid ‘Wharf Rat’, the previous journey to arrive there filled with drama and intrigue. The Dead portion of the soundcheck concludes with a solid but anticlimactic ‘Around and Around’, that leaves the assembled throng looking to find a place to sleep, and prepare for the following days awe inspiring display of music, stamina, and mother nature, that would extend to extravagant lengths. The following day would start at 10:00 AM and conclude very early on the morning of July 30th, history was about to be made. 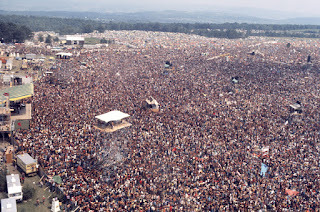 As the morning of July 28th, 1973 revealed itself the ground beneath the Watkins Glen, New York State concert site was preparing to hold the weight of 600,000 musical travelers ready to rock and roll. 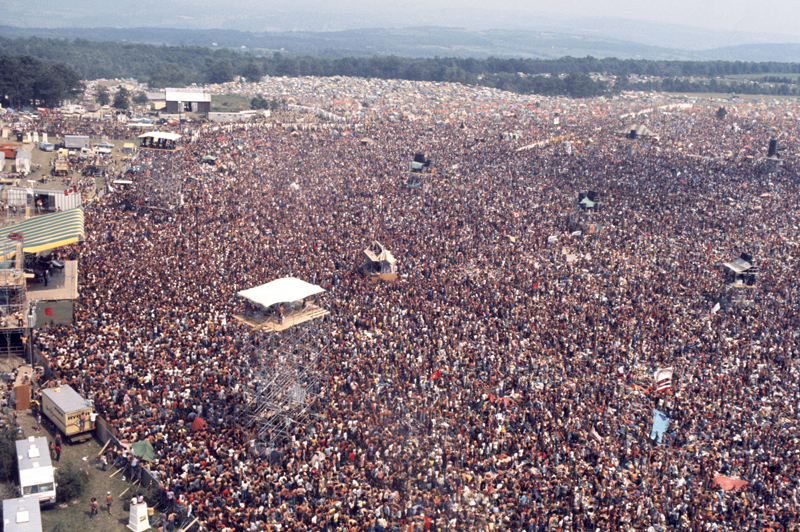 The largest gathering for a rock festival was about to take place with a legendary bill of bands that would play extended and legendary sets. After the previous evenings ‘warm up’, the groups as well as the crowd were primed for an all day event. Pleasant but humid New York Summer festival weather settled hazily across the bronzed crown of hippies slightly threatening summer storms. The awe inspiring event about to take place would make history in not only musical but social ways, the smoky remnants of that afternoon still smoldering in the annals of rock history. The Grateful Dead took the stage promptly at noon as the first act of the day to an introduction by Bill Graham who exclaimed, ‘From Marin County to Watkins Glen, the Grateful Dead!’ Blasting into an excitable ‘Bertha’ the Dead ran through a typical, that is to say, well played and amazing set of first set classics. The set is brimming with a typical East coast high energy, building to then detonating on a psychedelic pinnacle with the set closing ‘Playing in the Band’. Slithering through the some of the more familiar themes of the era, by half way into the jam Lesh and Garcia are exchanging husky scrubs and bombs, while the rest of the band is tied into a kinetic and electric fast paced groove. While not reaching the extravagant peaks of the jam from the night before, this is a thick and gooey ‘Playin in the Band’ from an era with many stand outs. Following a marathon ‘China/Rider of epic proportions comes a Summery ‘Eyes of the World’, the peak of the second set and of the Dead’s performance for of the day. The post verse jamming contains a plethora of melodic statements from Garcia, who in conjunction with Lesh assists in morphing the song into a swelling and pulsating improvised drift. From fifteen minutes on, Garcia plays like a man possessed and hits on several syncopated grooves that band responds to in kind, touching on the delicate spaces explored during the previous day’s sound check, before falling back into the recognizable ‘Stronger That Dirt’ theme. Garcia deliciously liquefies the band into choice of a well timed and well placed ‘Sugar Magnolia’. Observed as an entire piece of work the Grateful Dead played an amazing two days of music at Watkins Glen, a testament to their constant journey to strive for the golden note. The Band’s set started at 6:00 PM after the Dead’s extended four and a half display concluded and became an amazing cross section analysis of their legendary career, peppered with unique instrumental interludes specific to the Watkins Glen performance. Opening and romping joyously through a smoking cover of ‘Goin Back To Memphis’, the Band’s music captured the feel of the festival perfectly through its pastoral imagery and down home instrumentation. This is rock and roll, country blues distilled to its very essence; it doesn’t get much better than this! During these early moments of the Band set, the low point of the festival weekend occurred as a skydiver unfortunately missed their intended mark and perished on the grounds. As an addendum, there was a supposed ‘official’ release of the Band’s set from Watkins released in 1995, but after inspection and discussion it was revealed that this collection was/is a fraud and contains only two actual tracks from the event. The only way to hear the performance as it was is to hunt down one of the circulating audience recordings that exist in decent quality. This concert takes place in the middle of a year of rest and uncertainty for the Band. Looked at historically, the concert is a towering peak in the landscape of the Band’s performing career. The songs are tight, dynamic and rise and fall like a high speed run down a country gravel road. Garth Hudson is especially on his game laying down a plethora of breezy and inspirational keyboard flourishes that would culminate with his divergent solo spot “Too Wet Too Work’. Danko and Helm are locked in tight, and the vocals of Manuel, Danko, and Helm wrap around one another like a snaky gospel revival. After rocketing through a series of exciting high tempo tracks including ‘Loving You Is Sweeter That Ever’, and a drunken romp through ‘The Shape I’m In’, the group is eventually forced to leave the stage for twenty minutes because of threatening inclement weather. During the jam on ‘Endless Highway’ prior to their leaving, the crowd can be heard on the recording discussing and preparing for the incoming thunder storm. The ‘fly on the wall’ aspect of this field recording is especially entertaining. Levon Helm’s remembrance of this moment in his autobiography is that the group left the stage as the weather descended, gulped some Glenfiddich whiskey and watched Hudson return to his keyboard for his orchestral spotlight, ‘Genetic Method’ in this case driving away the rain in the process of the extended solo. Titled ‘Too Wet To Work’ in the case of this performance, Garth traveled through numerous musical landscapes, teasing dynamically, improvising, until the weather dissipated and the Band returned to the stage, slamming into a celebratory ‘Chest Fever’, that in Helm’s words would be forever ‘burned into his memory’. The crowd claps in time with the musical waves, a high point of the afternoon. The remainder of the Band set burns through an aggressive and elastic instrumental and then momentous and extended versions of smoldering rock classics like ‘Holy Cow’ and ‘Saved’, as well as crowd pleasing renditions of ‘Cripple Creek’ and ‘Life Is A Carnival’. Absolutely legendary, the monumental nature of the day as well as joy emanating from the stage translates well to the audience field recording I am blasting out of the ‘rock room’. 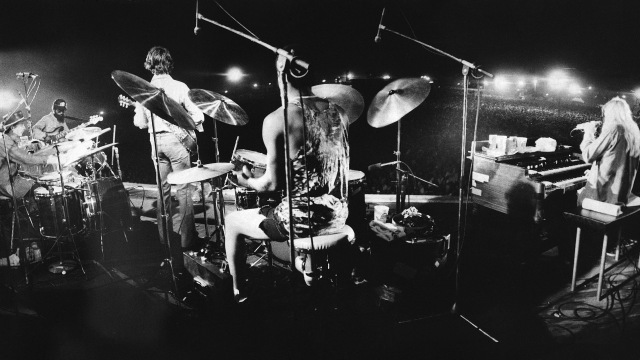 By the time Allman Brothers Band hit the stage at 10:00 PM, the almost one hundred acre concert site had become a swamp, and the happily soaked crowd swelled with anticipation for the upcoming musical onslaught. Opening with the recent for the time ‘Wasted Words’, the band is cooking from the get go with Betts and Allman dueling through vocals and slide guitar over the syncopated groove. The band receives a second introduction after the opener because Bill Graham wanted to make sure every band had each individual member introduced to the crowd. The Allman’s then swagger through beautifully crafted and possible ‘best of all time’ versions of ‘Come and Go Blues’ (featured on official release ‘Wipe the Windows, Check the Oil, Dollar Gas’) ‘Blue Sky’, ‘Jessica’, ‘You Don’t Love Me’, among others. Recent additions Chuck Leavell and Lamar Williams fill in admirably on keys and bass respectively. 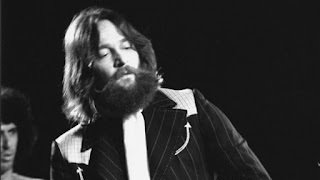 Leavell and Betts especially have developed an intense chemistry, bouncing hearty melodic ideas off each other throughout the show, with their interplay on ‘Blue Sky’ being a high point worth of inspection. The centerpiece of the Allman’s extended set is the mammoth performance of ‘Les Brers In A Minor’ which bookends a pulsating and dynamic drum duet by Jaimoe and Butch Trucks, the second of the performance following an aggressive ‘You Don’t Love Me’ duet. Each member gets a chance to express themselves as ‘Les Brers’ like its distant cousins ‘Jessica’, and ‘Liz Reed’ navigates a series of death defying twists and turns while solving a series of delicate melodic mysteries. Rock and Roll veteran Chuck Leavell’s extended dance with the black and whites is a pleasure to behold and spreads out a plush carpet in which the band uses to step into drums. This song represents a powerful and confident jam by the retooled group, asserting their ability to move forward while still respecting their past brothers Duane and Barry. Betts guitar lines range from syrupy amber licks to sharp stinging fly bys, the central pole in which the group revolves. The Allman Brothers set concludes with ‘Whipping Post’, hoped for, expected, and played like a runaway freight train headed down a dark midnight track. Peak after substantial peak is reached the crowd is astonished, amazed and taken to a unique place by the music played. The weekend ends bombastically, well past midnight following the Allman’s set when members from all three groups return to the stage for Summer Jam. Sincerely sloppy, and at moments stunningly brilliant the music continues into the dawn. Rick Danko appears first to drunkenly croon into the mic momentarily and quite endearingly, soon to be joined by Garcia, then Manuel and eventually Betts, Lesh, Allman and others for some more lengthy jamming to conclude the massive weekend of music to the crowds delight. The music drifting from the stage meanders for a bit before falling into the highlights, ‘Not Fade Away’, ‘Mountain Jam’, and’ Johnny B Goode’, a momentous and special way to conclude the Summer Jam. The ‘Not Fade Away’ is pleasant enough, but the twenty plus minute ‘Mountain Jam’ the follows elicits speeding clouds, percolating rivers, and joyous wilderness romping. Garcia is especially active, intertwining and responding to everyone on stage. Betts and Garcia together create richly constructed summits during their journey, pausing at scenic overlooks that dance with collaborative playing by all of the principals on stage. The musical movement comes as a defining musical statement for the weekend, an instrumental climax, a joining of ideas and people and a perfect example of the magic available through collaborative musical interplay and willing participants. 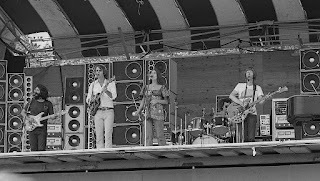 Watkins Glen, Summer Jam 1973 is not only notable for its collection of an amazing group of musicians, but for its eclectic collection of fans. The collaboration between the two of these principals combined for a historic and alchemic weekend combining music and experience. The encapsulated moment in time for this weekend will never be recreated, but fortunately forever enshrined on recordings and in the memories of the participants.